Sarah Morton-Erasmus grew up mesmerized by the sound of a cross peen hammer. By the age of twelve she was busy in her fathers studio soldering and sawing his copper scraps into jewelry and sculpture of her own design. Creating came naturally to her. Craft became skill, skill became art, and jewelry became her passion. In 1999, Sarah received a Bachelor of Fine Art from the University of Oregon in Metalsmithing. She continued her education by apprenticing with both goldsmiths and sculptors, balancing her skills with both small and large scale works. 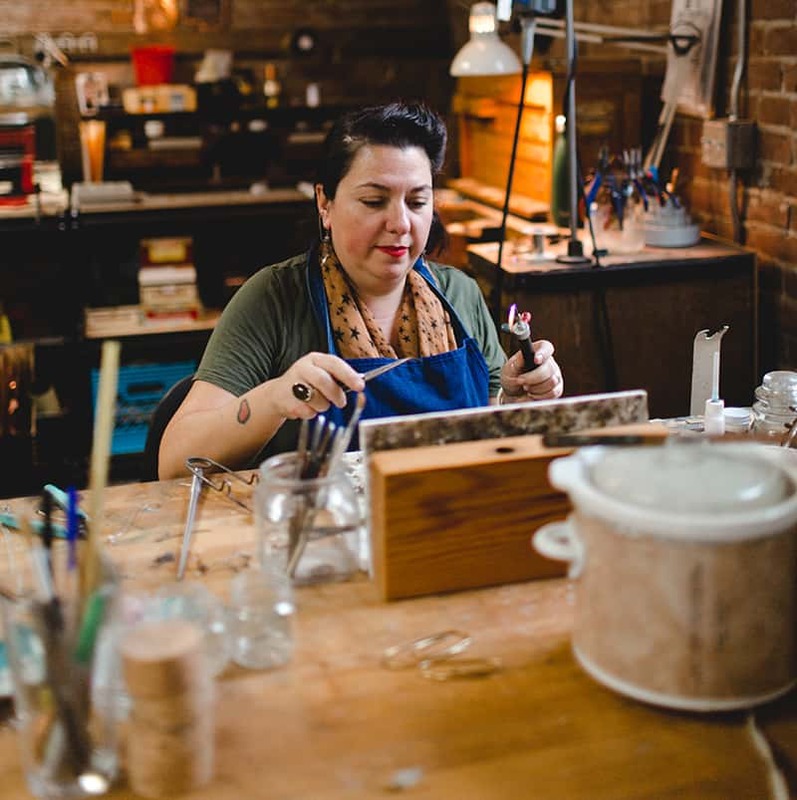 Morton-Erasmus Jewelry started to take shape in 2003, when she moved from New York to the Columbia River Gorge where she continues to create her jewelry and metal artwork. Her beginnings nurtured a respect for technique which fuels her creative process. “it has always been the process that fascinates me, learning a new technique or discovering how my medium changes and moves, usually precedes the design. My father taught me long ago -good design is all about method” In her studio there are boxes of “experiments” that she is constantly adding to when she is designing. Hinges, clasps, bits and pieces, waiting their turn to become something beautiful, something loved. All pieces are hand crafted of sterling silver, 18kt gold, and up-cycled vintage silver plate in our studio in White Salmon, WA.